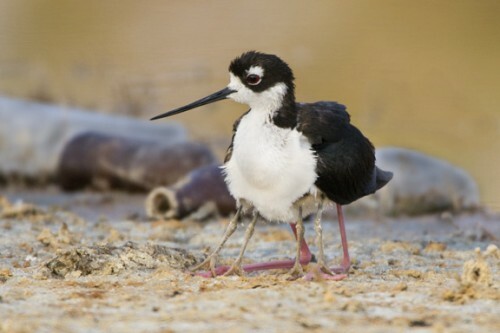 Saving the Black-necked Stilt, a U.S. International Boundary Water Commission Endeavor /Hawks Aloft Inc. Sometimes, or perhaps always, work projects do not proceed as planned. 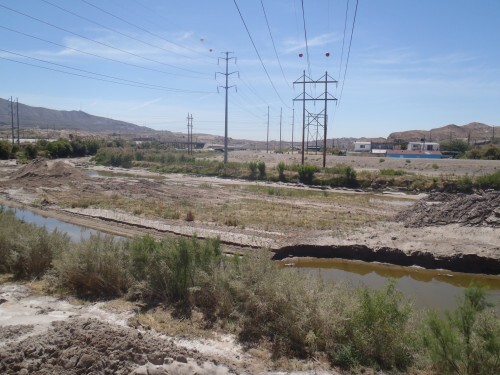 Such was the case in the lower Rio Grande near Anapra, New Mexico, where the U.S. International Boundary Water Commission (USIBWC) was performing maintenance operations to remove sediment accumulation in the river channel in front of an agricultural return drain. Operations underway the week of May 5, 2014 created a large island of sediment scooped up by heavy machinery. A surprise was in store for the crew when they returned to work on Monday, May 12. Apparently Black-necked Stilts found this barren patch of earth to their liking and set up nests over the weekend with eggs already present. Project area for the US International Boundary Water Commission. Image by USIBWC. 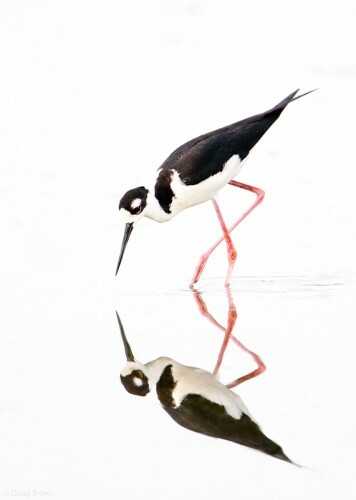 The Black-necked Stilt, a long-legged, strikingly black and white wading bird, nests on the ground. They tend to build above the water line on small islands, clumps of vegetation, or even, occasionally, floating mats of algae. Both females and males choose the site and trade off the nest construction duties; they look for places with soft substrate that can be scraped away to form the depression in which they nest. While one mate observes, the other scrapes into the dirt with breast and feet to form a depression about 2” deep. As they dig, they throw small bits of lining over their back into the nest, consisting of whatever material is closest to the nest, including grasses, shells, mud chips, pebbles, and bones. Black-necked Stilt. Image by Doug Brown. Back at the International Boundary Water Commission construction site, field crews surveyed the area and located some eggs on a large island of sediment that was being used to dredge out the channel. Three nests with a total of nine eggs had been documented by their environmental staff. The area was flagged and avoided. They contacted Hawks Aloft for recommendations, and we urged them to try to work around the nests. With a presumed egg-laying of May 10 or 11, hatch would be expected at about May 24 or 25. Rio Grande low flows in the US International Boundary Water Commission project area. Image by USIBWC. This issue was further complicated by plans to release water from Elephant Butte dam for the purpose of irrigation beginning on May 25, 2014. Because the logistics of any attempt to change the irrigation releases would have required multiple agency approvals that would affect planned crop irrigation in the surrounding valley, it seemed impossible to achieve. Once water releases occurred, it was probable that the nests would be inundated, killing the embryos or nestlings not yet mobile enough to escape the rising water. 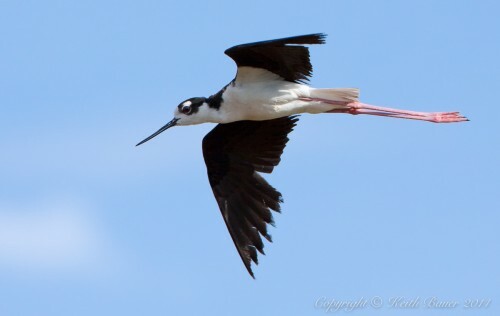 Black-necked Stilt in flight. Image by Keith Bauer. The maintenance staff at the USIBWC established and maintained a buffer around the nesting site. The nesting stilts did not appear to be disturbed by the heavy equipment in the area but aggressively defended their nests when environmental staff came to monitor the nest sites. The big question; however, remained: Would the eggs hatch soon enough to allow the young to survive? It would be close! On Thursday, May 22, 2014, ten Black-necked Stilt chicks were observed. The two nests of four eggs had hatched. It was clear that there must have been an additional nest located near the project area. 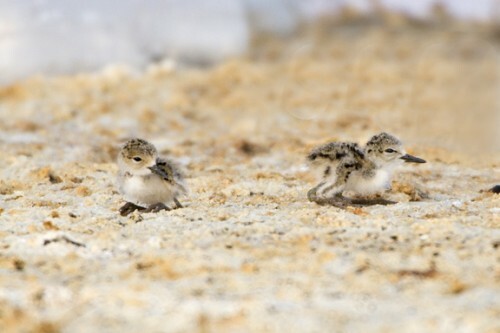 Black-necked Stilt nestlings. Image by David Powell. 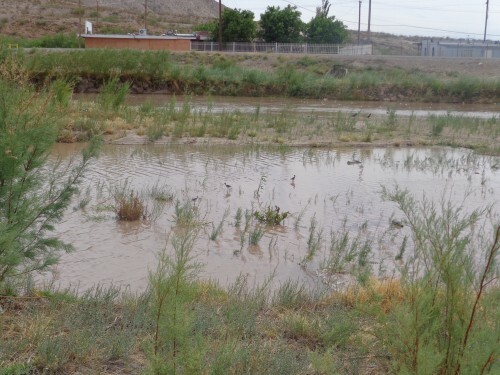 No work was conducted in the area over Memorial Day weekend, and water was released on schedule from the Elephant Butte dam on Sunday the 25th. On Tuesday the 27th, two chicks and adults were still observed near the project site in the morning, but all Black-necked Stilts had moved out of the project area by the afternoon. Disaster averted! Black-necked Stilt nestlings hiding beneath parent. Image by David Powell. We thank the USIBWC for proactively protecting these nests by mounding soil to divert water flows away from the nest sites and for establishing and maintaining buffer zones that enabled these Black-necked Stilts to produce young in 2014. We thank Rebecca Little Owl and Albert Flores, Environmental Protection Specialists, for their efforts to protect these nests and working collaboratively with Hawks Aloft to develop a mitigation plan.